As a young artist, my mother let me paint scenes on our living room walls. Today I paint and draw on pottery that I create. Art experiences since childhood always involved drawing and painting. After college, I began serious work with clay, bringing along a heavy background in drawing, printmaking, painting and design. For over 25 years, the primary focus of my work has involved integrating ceramic form with drawings inspired by life (and art). In forming my pots, I work on the wheel. I play with proportions of the belly, neck and lip of the pot. Bottle and gourd-like vessels are favorit forms. When the clay surface has hardened, I draw (carve) directly on the clay, allowing the imagery to evolve and grow around, up and down the pottery. I often draw (carve) through dark slip (liquid clay) that has been applied at leatherhead stage to a white clay body. I carve through the dark slip to reveal the contrasting white clay, giving attention to the negative and positive shapes of the design Sometimes I paint bits of colored underglaze here and there on top of the black slip. My pottery is fired to a stoneware (high fire) Cone 6 temperature. 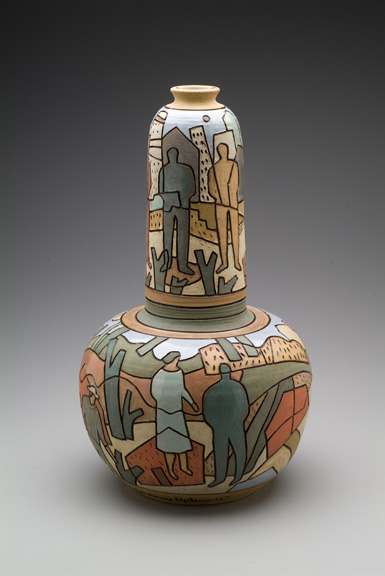 A lifetime of ART-doing, ART-looking and ART-teaching influences the drawings of my pottery. Art exhibits, art schools and gallery scenes are used as themes often, and at times, neighborhood and city scenes as well as events of the day influence the drawing for the work. Abstracted branches, leaves, houses, figures, and art objects can sometimes all be found twirling around in an abstract dance around my pottery. Directly related to the pottery drawings, on October 2006, I created a design for a large outdoor mural located at the Catholic Foundation Park on Flora Street across from the Meyerson Symphony Hall. The mural is titled *Celebrate Life, Celebrate Art*. The celebration of ART and LIFE seems to sum up perfectly the main theme that runs through all of m work presently.